Isabella Rossellini is an actress, writer, and model who at a point in her career rose to become the highest paid model in the world. She did that at a time when becoming a supermodel was no small feat. When she was 43, she got fired from Lancôme, the company that made her the highest paid model because, according to her, she was too strong. Twenty-two years down the line, she is back to Lancôme raising the curiosity of those who want to know all about her. The actress was born Isabella Fiorella Elettra Giovanna Rossellini alongside a twin sister, Isotta Ingrid Rossellini on 18 June 1952 from the scandalous marriage of Ingrid Bergman who was a Swedish actress and Roberto Rossellini who was an Italian film director. Of Swedish, German, and Italian descent, Rossellini was brought up alongside her elder brother, Robertino Ingmar Rossellini, her twin sister who is now a professor of literature, and a half-sister, Pia Lindström in Rome and Paris. At the age of 19, she was off to New York where she worked with Radiotelevisione Italiana as a translator and TV reporter while also attending Finch College. That said, she came to prominence at the age of 28 when she began a full-time modeling career that spanned for many years. Through it, she has worked with big photographers including Peter Lindbergh, Norman Parkinson, Annie Leibovitz, and Helmut Newton. In 1982, she rose as a supermodel to become the Lancôme’s exclusive spokesmodel. Her job at the time, according to her, was to be beautiful and shut up. She worked with the French cosmetics brand before she was fired in 1996 for being too old at the age of 43. However, she would find her way back to the company in 2016, this time around, as a global brand ambassador. Apart from modeling, Isabella Rossellini also made a name for herself as an actress which is something unsurprising since her mother was a 3-time Oscar winner. Her first appearance was alongside her mother in A Matter of Time (1976). In the years that followed, she acted in many more movies such as Blue Velvet (1986) which earned her an Independent Spirit Award for Best Female Lead and Death Becomes Her (1992) which got her a Saturn Award for Best Supporting Actress. She has also taken part in many TV shows such as Crime of the Century (1996), Chicago Hope (1997), Don Quixote (2000), and Shut Eye (2016-2017). She has also had many voice roles including in the 1996 video game, Goosebumps: Escape from Horrorland. For a woman of her status who has gone as far as she has and achieved that much in a modeling and acting career that spanned many decades. Apart from the various awards she has gotten, she has a massive net worth that has been estimated at $65 million. Obviously, she has made her fortune from acting, modeling, writing, and other things she has been involved in. Looking at her personal life, Isabella Rossellini has been married two times in the past. The first was to Martin Scorsese in 1979. Unfortunately, the marriage did not survive beyond three years as it ended in a divorce in 1982. A year later, she walked down the aisle for the second time, only for it to again, not see past 3 years as it was dissolved in 1986. Even though she did not get married again, the actress and model began a relationship with the American filmmaker, actor, and musician David Lynch who became her partner from 1986 to 1991, and then Gary Oldman who became her partner from 1994 to 1996. From her marriages, she has a daughter, Elettra Rossellini Wiedemann who was born in 1983 to Jonathan Wiedemann. Elettra works as a fashion model, and a food editor and writer. Isabella also has an adopted son, Roberto Rossellini, who was born in 1993. Interestingly enough, while making money, she has also taken the time to give out through her involvement in philanthropic activities most especially regarding conservation and through her Guide Dog Foundation, she is training dogs to guide the blind. 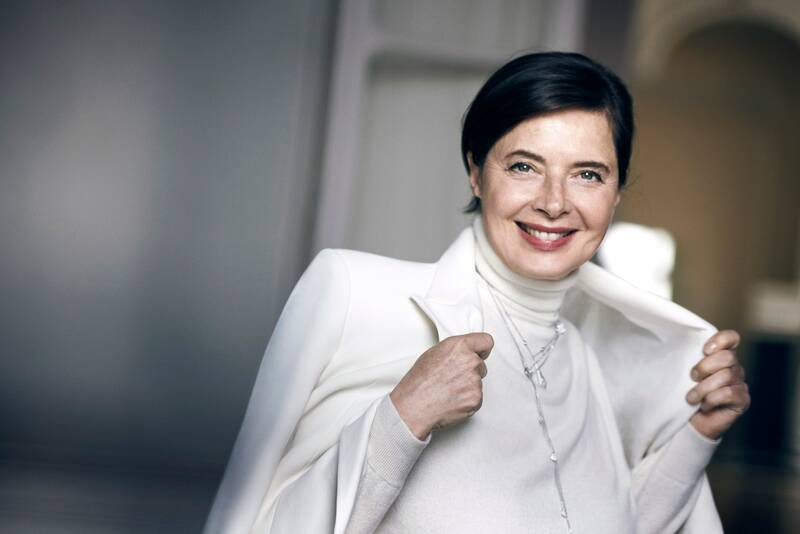 Seen as one of the most beautiful women in the world in the 1980s and 1990s, Isabella Rossellini does not just have the looks, but she also has a good height of 5′ 8″ (1.73 m) to accompany it. The actress also has three books to her name; Some of Me (1997), Looking at Me which was published in 2002, and In the name of the Father, the Daughter, and the Holy Spirits: Remembering Roberto Rossellini (2006). She has a citizenship of the United States and Italy and is fluent in Italian, French, and English. Her modeling career began thanks to Bruce Weber who discovered her and then helped her to start.